Saving The Klamath River: An Interview With Fly Fishing Guide Craig Nielsen | California Trout, Inc.
Craig Nielsen is the owner of Shasta Trout — a Northern California fly fishing guide and outfitting service that regularly puts clients on the Klamath River (and catches a lot of steelhead doing it). With the Klamath River, dam removal and the KBRA agreement being so much in the news these days, we thought we’d talk to Craig a little about his current experience on the Klamath River, how he thinks the Klamath Basin Restoration Agreement might improve it, and what his hopes are for the river’s future. So many of California’s fishermen don’t know much about the Klamath, which features a good steelhead fishery — but could be home to a great one if given half a chance. 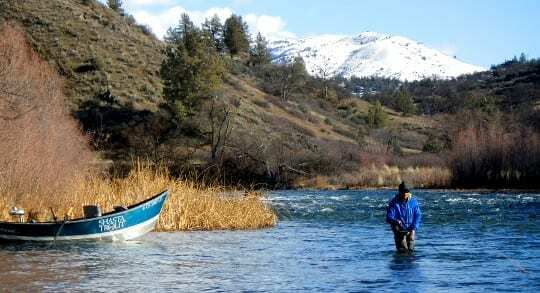 CalTrout: How often do you find yourself on the Klamath these days? Nielsen: I was on it five of the last six days — about 60-80 days a year. It represents about 1/3 of my guide trips, but a larger proportion of our outfitting — we guide more big groups on the Klamath River. 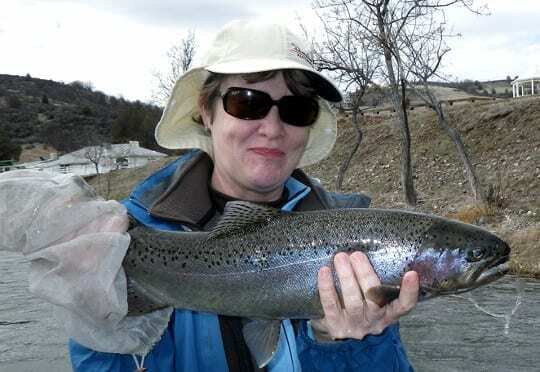 CalTrout: What draws you to the Klamath? Nielsen: I live here in Mt. Shasta; I’m close to to the Klamath. Plus, I like it and guests very much enjoy it. I fished with two guys yesterday who haven’t fished the Upper Klamath in years. They had a great time. The Klamath went through some hard years and I think it fell off the map a little. It’s a legendary river, yet most California’s fly fishermen haven’t rediscovered it, which is too bad because the steelhead fishing is great. I know a well-traveled fly fishing travel agent who fishes all over, and when I asked him to name a lower-48 steelhead river more productive than the Klamath, he couldn’t. I’ve guided roughly 150 fly fishermen on the Klamath this season and I can easily count those who were skunked on one hand. The steelhead aren’t that large, but the river’s very productive. I don’t fish for the salmon, but know that a lot of fly fishermen do, and I’d expect more would if the dams were removed. CalTrout: How many guides work the Klamath regularly? 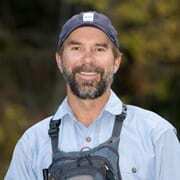 Nielsen: I see less than a half-dozen regular fly fishing guides on the upper river. Some times of the year it’s much less. It’s not an overworked river by any means. CalTrout: The Klamath Basin Restoration Agreement (KBRA) should open up almost 420 miles of steelhead spawning habitat. How will that affect the fishing? Nielsen: As good as it fishes now, the whole river can still be dramatically better. Even in good years — which can be very good — we’re still looking at small remnants of the historical runs. A fraction of what we could have. If we can get the steelhead some cold water and habitat, It cold become amazingly good. Think about it; despite its problems, the Klamath remains one of the healthiest rivers in the state. The fly fishing is already good, and we’re still only seeing maybe 10% of the historic runs. Certainly the potential exists; we’ve seen it happen on Butte Creek and on the Shasta River, where simple improvements quickly led to large numbers of fish. Nielsen: Exactly. They put a little water back in the Trinity, people started catching steelhead, and now you’ve got to bring your own rock to stand on. The nice thing about the Klamath is its size; it’s wide and 190 miles long. If they pull the dams down, then you’ll have this good-sized steelhead river that can accommodate a lot of anglers. Plus, the Klamath’s steelhead run is a long one — the fish enter the river early and stay for a long period of time, which is good for fishermen, guides and the businesses that serve them. CalTrout: You’re considered something of an expert on switch rods and swinging flies. You do that on the Klamath? Nielsen: Absolutely. The Klamath isn’t as unpredictable as some steelhead rivers. It doesn’t flood out easily, like the Smith for example. It’s got all that marsh upstream just soaking up water like a sponge. Unlike our other steelhead rivers, you don’t have to wait for the Klamath to dirty up just a little before you start swinging flies. It’s always a little stained, and you can productively swing flies using two handed fly rods most of the time. As more people realize that, they’ll start gravitating towards the Klamath. CalTrout: You said you already count on the Klamath for a sizable portion of your revenue. What affect would its recovery have on the area? Nielsen: I’m looking forward to seeing the salmon and steelhead runs recover. I’d love to see the Klamath as a river on the way up instead of as a river in a slow decline — like so many of other rivers. The Klamath is ripe for a rebound, and we could easily find a truly astonishing steelhead fishery right in our own state. It’s a lot closer than British Columbia. The KBRA could mean a lot to this area; along the edges of the river, you can still see the remnants of the old lodges and hotels that served fishermen before things got bad. They’re all boarded up. Rebuild the Klamath’s fish, and at least some of them will come back. And a lot of guides, outfitters and businesses could make a good living up here if we had the fish. CaliTrout: Thanks so much for talking to us about the Klamath. Nielsen: You’re welcome. It’s a good fishery that could become a really great fishery. Un-build it, and they will come!!! Let’s insure the future health of the Klamath before we visualize increasing fish takes. One of the aims of the interview was to help CalTrout’s membership understand the benefits of a healthier Klamath River, and certainly, a stronger steelhead fishery is one of those benefits. And in terms of fish “takes,” the steelhead fishery is largely catch & release. I havn’t fished the river since 90’s. It was the best with the sac.being good. I’ve been fishing the elk on oregon coast. I’ll be back this year to the sac. & clam. predections look good, keep a tight line. For steelies i stay close to home, russian,american, & grualla. It’s great and the dam removal will be an eventual, long-term boom for the area. Unfortunately (or, fortunately for the watershed) it’s a day’s drive for most of us to get up there…. but worth it!